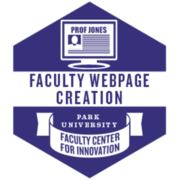 The creation of a faculty webpage produces an electronically accessible webpage or website that can host a collection of multimedia content, links, pages, and various information pertaining to a course or instructor. This badge acknowledges expertise development to create a faculty webpage or website. Recipient participated synchronously or asynchronously in a Faculty Center for Innovation-sponsored learning community on the topic of Faculty Webpage Creation and has produced a reflection on how the knowledge gained has affected his/her teaching, scholarship, or service.